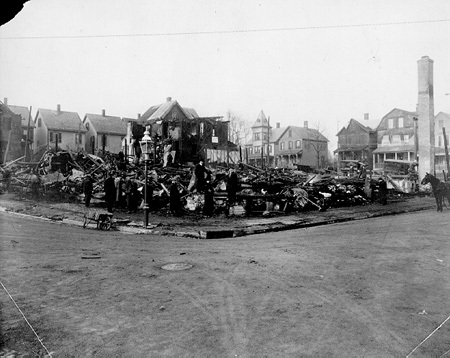 Photograph taken in the afternoon of January 13, 1913, showing the Thanhouser Film Company studio ablaze and the aftermath. The Thanhouser Film Corporation's entire plant at Grove and Warren Streets was completely destroyed by fire this afternoon. It took but an hour before the building with its valuable contents were a flat heap of ashes. Two houses adjoining the factory and studio caught fire and were burned down before any impression could be made on the flames. Poor water pressure at all points where the two steamers were not used was the cause of the fire spreading to the adjoining property. The roof of the cupola of the Ruppert Brewing Company's station opposite the Thanhouser place caught fire from the terrific heat, and it was 20 minutes before a stream of water was put on it. All the employees in the factory and studio had narrow escapes from injury. Some of them had to jump out of the windows. All the actors and actresses lost their wardrobes. Miss Marguerite Snow, the leading woman, lost her entire new wardrobe which arrived this morning. At the first shout of fire from the dark room, the men and women working in the factory leaped for the exits. The flames, which were already roaring at the south end of the building, swept around both sides and shut off the escape by the stairs. Many of them had to leap out of the windows. Mrs. Hattie McCroskery, employed in the journey room, dashed into the film storeroom and began handing out reels of film in tin cases to the men who threw them out of the windows. The flames came nearer, and the men shouted to her to run for her life, but the girl stuck to her post until she had nearly every reel out of the storeroom. She was finally obliged to retreat and escape through a window. C.J. Hite, the president of the company, Bert Adler, the publicity agent, and a boy, John Desmond, after they had escaped from the building, went back to assist in the removal of some of the more valuable contents and the office records. They saved much of the property and then had to leap from the office window 15 feet from the ground. Fire Commissioner Frederick E. Winter was one of the first firemen on the spot. He went into the building to see if it was safe for the firemen to enter. The employees were leaping through the windows. As he started up the stairs there was an explosion which hurled him backward down the stairs and out of the door. Many of the firemen were burned or cut by glass from the windows and skylights. Streams of water were played into the building which was a roaring furnace five minutes after the fire broke out. The heat on all sides was so intense that the firemen had to stand well off from the building. In a few minutes the houses opposite in Grove Avenue were blistered and scorched, and the houses occupied by August, Effern, Finn, Moore, Kerwin, and McGrath caught fire. They were saved by the firemen. The house next to the factory on Grove Street occupied by Hyman Bolnik was destroyed, and the one in the rear on Crescent Avenue occupied by James Graham caught later and was burned nearly to the ground. Occupants of all of the houses on Grove Avenue, Crescent Avenue, and Walnut Street, adjacent to the factory, moved out and piled their furniture in the street. Mr. Hite said the loss is about $60,000 and there was no insurance. He said the company will resume work tomorrow or Wednesday. The open air theatre was not damaged by the fire. "I intend to build a fireproof structure in New Rochelle," said he, "because I like New Rochelle and intend to stay." Nothing could have saved the building of the Thanhouser Film Corporation, Grove Avenue and Warren Street, which was burned to the ground yesterday afternoon. It is said that only a miracle could have saved the houses of Hyman Bolnik, Grove Avenue, and James Graham, Crescent Avenue, which caught fire from the Thanhouser flames. With low water pressure and an idle motor fire engine which lay inert at fire headquarters, the firemen did heroic work in the scorching heat and saved a dozen dwellings that at one time seemed doomed. It was fortunate that there was almost a dead calm during the fire, for even a light breeze would have meant a conflagration which would have reduced at least one closely built block of frame houses to ashes. 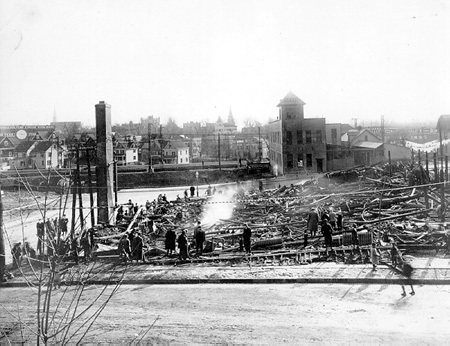 Several houses were scorched by the heat, some of them caught fire, and the roof of the cupola on Ruppert's Brewery station, Crescent Avenue, caught fire. The firemen soaked all surrounding houses with water and extinguished the flames at all but the Bolnik and Graham houses. The Thanhouser plant and its contents, valued at $60,000, are a total loss. Very few of the employees were able to save any of their personal property in the cloak and dressing rooms. Actors and actresses escaped in their stage costumes and makeup, leaving street clothes and extra wardrobes in the dressing rooms. David Thompson, one of the actors, was the only one to save anything. He dashed into his dressing room and saved his vest in which was his gold watch and chain. The employees lost considerable money that was burned with their clothing. The solid column of black smoke that rose straight up from the burning building attracted people from many miles. A few minutes after the alarm was rung there was a crowd of several hundred watching the fire. The crowd increased every second until before the walls fell several thousand people were gathered on railroad bridges and in the streets approaching the blaze. It was undoubtedly New Rochelle's biggest fire. It is said by old firemen that though the fire that destroyed the Ferguson Building, Main Street, many years ago was a fiercer and more stubborn one, it did not cover so large an area and was not so spectacular. 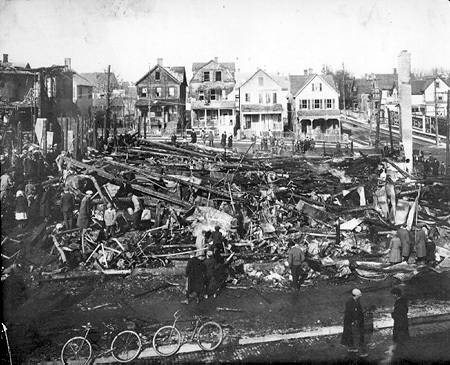 The fire which destroyed the powerhouse of the Westchester Electric Railway, Washington and Webster Avenues, in 1903 was a big fire and lasted longer but the surrounding property was saved. It is fairly well established that the fire started in the perforating section of the darkroom on the east side of the building. It is believed that a spark, perhaps from an electric coil or from friction in one of the perforating machines, set fire to a reel of film. The film, which is on a celluloid base, burned so quickly that it was practically an explosion, and the flames catching in the dark curtains and woodwork spread through the dry wooden building with almost lightning speed. In a few seconds the darkroom was filled with suffocating black smoke of burning celluloid and the fumes of camphor and paint. The employees in this department dashed for the doors into the open portions of the building shouting "fire." At once there was intense excitement. Employees working in the mechanical departments, actors and actresses on the stage dashed toward the cloak and dressing rooms but were driven back by the flames which had already shot around two sides of the building and were attacking the roof. Bert Adler, the general publicity agent, rushed out of his office with Charles J. Hite, president of the Thanhouser Film Corporation, and shouted for order. Every person in the building stopped. Mr. Adler shouted, "To the stairs march." More than 50 people including photoplayers and employees marched silently and in perfect order down the stairs bareheaded and coatless. As they left the main floor, a tongue of flame shot up from the rear and the scenery crumpled up like paper. Mr. Hite, Mr. Adler, and John Desmond, an office boy, turned back to the offices to save some of the company's records. They threw out of the windows bundles of checks and money, books and papers until they were compelled to leap out of the windows on account of the heat of the fire that was roaring about them. This was about five minutes after the fire flame, and the building was a roaring furnace. Fire Commissioner Frederick E. Winter, who was one of the first firemen to arrive, dashed into the building through the main entrance and started up the stairs. He was warned not to go in but he wished to see if it were safe for the firemen to work inside. As he neared the top of the stairs there was an explosion and he was hurled backwards down the stairs and out to the street. He was slightly scorched. Two steamers were coupled and in a few minutes after the alarm rang the firemen had four streams of water playing into the gigantic mass of flame. The water made no impression on the fire. It turned to steam before it reached the burning material. The steam, mingling with the rolling column of black smoke, had the appearance of one of the new plumes for ladies' hats. As the fire became fiercer the heated area was widened, and the firemen who stood close to the burning building were obliged to give back foot by foot. The heat was so intense on all sides that the wet sidewalks were steaming for 100 feet on all sides. The firemen at the nozzles were relieved every few minutes by fresh relays of firemen while they retired, gasping and shielding their faces from the fire. Samuel W. Dassler, commissioner of assessment, who was formerly a fire commissioner and one time head of the department, ran across the street under the wall of the factory to straighten out a line of hose. His right arm was badly scorched by the heat. Several firemen who refused to retire when their comrades did were scorched and cut by glass, but it is reported that none were seriously injured. The water pressure was so low, possibly because the engines drew such large quantities from the pipes, that little could be done with the lines of hose not attached to the engines. Then houses occupied by Hyman Bolnik, Mrs. Maher, Sophie Kallenberg, August, Ephran, Finn, Moore, Kern, Slattery, James, Graham and Hoffer began to smoke and scorch. The firemen with the extra lines of hose climbed porches and turned the weak streams on the houses to save them if possible. The houses of Ephran and Finn on Grove Avenue opposite the factory caught fire near the top, but the flames were extinguished. When the roof on the Ruppert building began to blaze, ladders were erected, and it took ten minutes to raise a line of hose to a height to where the water could be poured on the flames. They were extinguished in a short time. When the roof of the factory fell with a loud crash, a cloud of cinders leaped into the air but the draft from the fire was so strong that it carried them upward several hundred feet and they were burnt out before they fell. The group of firemen stood at the rear of the factory pouring water into several windows. When the walls tottered Chief James Ross shouted to them to run for their lives. As they saw the wall sway outward, they dropped the nozzle and ran to the street just in time to escape the burning timbers that crashed downward to the spot where they had stood. The line of hose was caught under the debris and consumed. Soon after the walls fell a can of chemicals exploded near Grove Avenue, making a loud report and throwing blazing debris into a group of firemen from Engine 3. The firemen, who were holding a nozzle, ducked and held their ground while others shouted to them to retire. Though they did not know when there would be another explosion, they stuck to their post. A little later there was a series of sharp reports from the Warren Street side. These were believed to be blank cartridges exploding. In less than an hour after the fire started, the Thanhouser was a level mass of flaming ashes and the Bolnik and Graham houses were a few glowing sticks with part of the walls standing. When it seemed that all the houses on the block with the factory were doomed, the occupants began to move their household effects into the street. Bedsteads and bedding, clothing, parlor, bedroom and kitchen furniture, were piled in the mud of Walnut Street. Women sat ringing their hands while men and children waited and anxiously watched the firemen saving their homes. From one house on Crescent Avenue two men carried out a small cylinder stove and dumped the coal fire on the lawn and then carried the hot stove a block away where they sat it down in the street to cool. One of the bravest actions ever witnessed was that of Mrs. Hattie McCroskery, employed in the journey room. When the shout of "Fire" rang through the building, she dashed to the stockroom and began handing out the tin boxes containing the negative reels to men who passed them through a window. She worked until the men called to her to run and save herself. "I will when I have to. You keep on the job and take these films," she called back. Then she began to joke with the men as she ran back and forth to the stockroom carrying armfuls of valuable reels. When the last reel was safe, the heat had grown so intense in the stockroom that she was forced to rush for the window where the men helped her out. She was one of the last to leave the building. It is reported that Miss Bishop, one of the office assistants, went back into the burning building to try to save a brooch, which she values at $1,000 and which was in her purse in her coat. It is said that fireman Bantel and another fireman who had gotten into the building just after the others had left, stopped her. She grabbed the partition, and the firemen had to strike her on the muscle of the arm to break her hold. She was carried out of the building. The brooch was lost in the fire. Miss Marguerite Snow, the leading woman of the home company who was on the stage when the fire broke out and who escaped with the rest, is reported to be confined to her room at the Washington Inn today as a result of the excitement and the loss of her expensive wardrobe which arrived yesterday for a new play. One gown is valued at $75. There is a story that Charles Van Houten and John Andren, who were in the projecting room on the second story when the fire broke out, were trapped and had to cut their way out through the roof with an axe. Several motion picture factories in New York and other cities have telephoned to Mr. Hite offering the use of their factories and studios until temporary quarters can be established and machinery obtained. Before the fire was out yesterday, Mr. Hite had hired the Banks and Kobbe Garage on Center Avenue, but it was later decided not to use it. The merchants in New Rochelle are helping in the search for a place for a temporary factory and studio. Mr. Hite announced yesterday during the fire that the employees would continue under salary as though nothing had happened and that he would resume work today or tomorrow if cameras could be procured. It is probably the only case on record where a large concern lost only half a day after being burned out. Mr. Hite said last night to a representative of The Evening Standard, "I want to thank the people of New Rochelle, the merchants, and our contemporaries in the motion picture business all over the country for the kind offers of help. We intend to remain in New Rochelle and will build a fireproof building before long." The play being produced was an adaptation of Sherlock Holmes. A scene was in progress before the camera when the fire broke out, and the actors and actresses had to leave the building in costume and makeup. They stood in a group with the other employees and officers of the company in Warren Street. As the blaze began to die down, the photoplayers walked about the city in their makeup and attracted much attention. One man dressed in pink tights had just time to get away with his hat and to grab up a green portiere as he made for the stairs. He was an amusing sight among the crowd. All the releases for six weeks to come had been placed in the vaults of the National City Bank as they were finished and were safe from the fire. The negative reels, saved by Mrs. McCroskery, were taken there. Mr. Hite and several members of the company went to his home in Rochelle Heights where the New York Telephone Company installed a special operator and remained until a late hour last night. Mr. Adler and Mr. Hite were kept busy nearly all night answering inquiries of friends, neighbors and other motion picture firms. The Thanhouser Company has hired the building of Cooley and West on Union Avenue near the railroad station which it will use as a temporary office. A telephone has been promised at noon today. The Westchester Lighting Company had men at work while the fire was in progress removing electric wires and making them safe. 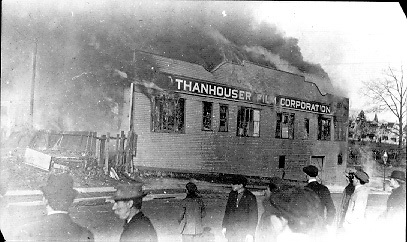 The Thanhouser Company, which has always been among the first at a local fire to make motion pictures, did not make a picture of its own fire. The three cameras were in the building and could not be saved. It would have made an exciting fire scene. Several amateurs trained their hand cameras on the blaze and got pictures. Neither the building nor the plant were insured. Fire Chief James Ross said today, "The Thanhouser fire was the largest and fiercest blaze the local firemen have ever encountered. The total loss is estimated at $85,000, divided as follows: Thanhouser plant, $60,000; building, $15,000; two houses and damage to others, $10,000. The residences of Hyman Bolnik and James Graham were totally destroyed. The cupola of the Ruppert Building and the fronts of two houses opposite the fire on Grove Avenue were badly scorched. Two alarms were sent into fire headquarters, one from the Thanhouser office and the other from Ruppert's." "When the firemen arrived, the employees of the factory and studio were working diligently with their chemical apparatus. Our firemen behaved heroically and did excellent work. I am proud of the volunteer firemen of New Rochelle. They did all that could be done by human beings. It was impossible to save the factory, and with the poor water pressure they performed almost a miracle in saving the other houses. They took many risks, and I don't know how so many of them escaped with whole skins. It is fortunate there was no wind, for it is impossible to tell how many families would be homeless today." Another article in the January 14th edition noted that 2,000 copies of the extra edition of the 13th had been sold by "newsies," some of whom sold papers for five cents. Charles J. Hite and Bert Adler congratulated the newspaper on its extra edition and its accurate account of the fire.